Vintage Belt Buckle "Smith & Wesson" Cowboy On the Run! Home > Men's Accessories > Vintage Belts / Buckles > Vintage Belt Buckle "Smith & Wesson" Cowboy On the Run! Groovy Vintage Belt Buckle! "Smith & Wesson" is carved below an action packed moment with a cowboy on the run, firing his gun at some boatmen in the distance. Super cool! Light, Brassy finish. 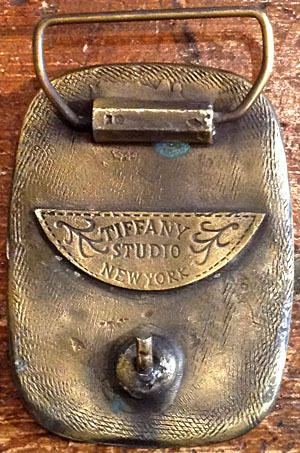 Text on the back says "Tiffany Studio New York". Condition: Very Good: Has some patina spotting.